A while back when I started blogging in 2009 I didn't really worry too much about the way my blog looked as I didn't have any followers, over the years though I've noticed an increased in readers and I'd really like to have an easy to look at blog. If you've seen my blog each month you've probably notice I keep changing it design wise.... a lot, well I want to get away from that so I will be doing one last design update. I'd really love to get my readers feedback on the site as I'd like to make it easier to read through and more pleasing to the eyes. So if you have a moment it'd be great to get any feedback you would like to share with me. Anyway if you guys could take a moment to answer any or all of the questions below that would be great and much appreciated! What colors do you find easy on the eyes when reading a website, do you like the current white? Do you find the reviews helpful? Do you find the product/swatch photos helpful? What kind of posts would you like to see more of? Should I change the posts to include a "click to continue to read" or leave the posts open on each page in full? Is there any companies you'd like to see me review in the future? Do you miss the youtube tutorials/ would you like to see me do reviews or haul videos? Is there any other feedback you'd like to offer? 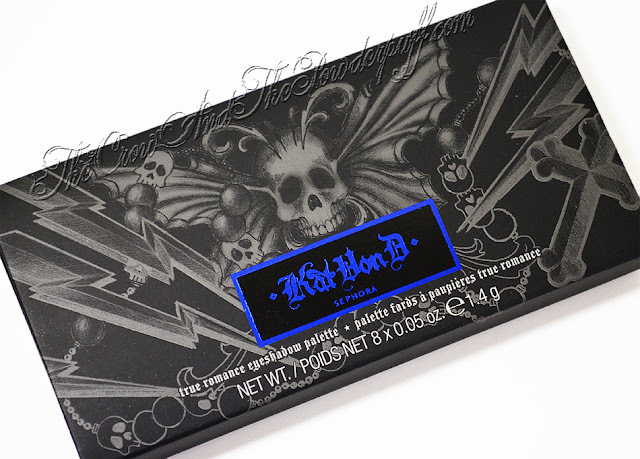 For helping me out on this I will be choosing one person who comments with feedback (no enter me comments) to to win a Kat Von D Discontinued True Romance Metal Orchestra Palette. You must be a follower via GFC (Followers tab on the top left of the site) and comment. I think the white is ok, however, I prefer blogs with a darker background and a lighter text. It's less bright which generally doesn't hurt my eyes. And makes the blog easier for me to read at night (with lights off to not wake anyone else up) or during the day. Yes I do. I love the amount of detail you put into your reviews. Yes! This is something I wish EVERY beauty site did, especially swatches. I know most lipsticks/eye shadows look pretty in the tube/pan, I'm more curious to see what it looks like outside. My favorites are always first impressions and review posts. I always check the blogs before investing in a new product. I'm not all to picky about this. However, I know people with a slower connection would probably prefer the read more on picture heavy posts because it would speed up loading time, and they could only choose to load the posts their interested in reading. I like hearing about newer, up and coming brands. As well as smaller indie type brands that don't get much recognition. I love youtube tutorials and reviews. And of course Haul videos are ALWAYS my favorite. Thank yoy for the giveaway!!! What kind of posts would you like to see more of? reviews and swatches, but I love watching tutorials on you YT channels. - What colors do you find easy on the eyes when reading a website, do you like the current white? Thank you so much, I'm glad you like my looks! :) Also wonderful feedback, I will see about moving the search to the top! I do tend to neglect the nail tutorials, I am very new at messing with nail art but I will definitely work into posting those kinds of tutorials! -The white background works just fine, I prefer it since its easy to read text. -Click to continue is a good idea, I like seeing a variation of posts just on the front page. -I prefer drugstore brands a lot since its easier for me to purchase them. -Honestly I wouldnt change a thing about your layout, Ive seen much worse and while some put a lot of thought into their layout its nice to see a simple and clean layout. - Very much! Yours are always very good! - Maybe that would make the homepage more "organized".. I love looking at nail art for inspiration. Please leave them open. I hate having to click more than necessary. I don't miss the videos. I'll definitely be trying to get back into the makeup tutorials again soon, I miss doing them for you guys as well! Q1) What colors do you find easy on the eyes when reading a website, do you like the current white? A1) White is actually hard on the eyes, or it is on mine. A blue shade or light green or cream, if you want to keep it light, would be easier on the eyes. Q2) Do you find the reviews helpful? A2) Absolutely! I love a good candid, thorough review, and if swatches are included if it's makeup, even better. Q3) Do you find the product/swatch photos helpful? A3) Oh, yes. Good swatches taken in good lighting as so very helpful. I appreciate them. Q4) What kind of posts would you like to see more of? A4) Since my interests lie in makeup for the most part, I will always like more makeup posts. Q5) Should I change the posts to include a "click to continue to read" or leave the posts open on each page in full? A5) I like content all on one page. I do not mind scrolling downwards, it is more clicking that I would to prefer not to do. Q6) Are there any companies you'd like to see me review in the future? A6) I can't think of any offhand. Q8) Is there any other feedback you'd like to offer? A8) No, your blog is professional and a pleasure to visit. I have brighter monitor so sometimes the white background bothers me as well! I was definitely going to try and keep it more on the lighter side as reading blogs with a dark background and light text makes my eyes have those weird lines in my sight after! I love blues and greens so will definitely consider that when I redesign/have the blog logo created! 1. )What colors do you find easy on the eyes when reading a website, do you like the current white? -- I find that the black and white is easy to read, whether it's a black background and white lettering or how you currently have your site! 2. )Do you find the reviews helpful? -- I definitely find the reviews helpful and you do a great job at reviewing products and giving us your honest feedback! 3. )Do you find the product/swatch photos helpful? -- Yes definitely! Your swatches are beautiful! 4. )What kind of posts would you like to see more of? -- Could you do a post on your lighting setup and how you take/edit your photos? Maybe FOTD posts? 5. )Should I change the posts to include a "click to continue to read" or leave the posts open on each page in full? -- Yes I like those types of posts better! 6. )Is there any companies you'd like to see me review in the future? -- Not sure if you have tried them yet but Detrivore Cosmetics is one of my favorites and I really think that you would like them! 7. )Do you miss the youtube tutorials/ would you like to see me do reviews or haul videos? 8. )Is there any other feedback you'd like to offer? I will definitely try to do a post on my lighting setup with how I take and edit pictures and more FOTDs! -Definitely white! It's always the easiest to read. -Yes! I like how you take different photos from different angles. The swatches always look clear. -I really don't like "click and continue" thing. Time consuming *for me*. -More Femme Fatale! Or any cruelty free company. I actually have an organic skincare brand called Suki that I've been using for a little while, I will have to review that soon. I prefer black text on a white background, or black/gray text on a very soft pink or peach background. I don't like light colors on darker backgrounds. I absolutely find the reviews helpful! I definitely find product swatches more than helpful! I would love more tutorials for some of your amazing eye looks. I prefer seeing posts in full rather than having to click through. I'm interested in seeing more reviews of cruelty-free big-box brands or smaller indies. I would love to see youtube videos linked here on your blog. I rarely have time to watch all the vids I'm subscribed to on youtube, so having them show up on my feed is so much better for me. Will definitely get together some more cruelty free products for reviewing! I like white backgrounds, always makes it easy to read. I do like some color in a layout too. Most blogs I've found by searching for reviews of a particular product and if I find the review helpful (swatches, supported opinion) that's when I add to GFC. So probably for readers like me, the more reviews, and the more complete the reviews, the better. I love review posts, but also DIY posts. I will definitely keep up with reviews this year, I'll also try to post more DIY! I do! Very much so. As always, I like having a trusted source that I can go to to see what someone else thinks of a product before I decide to buy it! Yes! Just as much as reviews, if not more. I love swatches, even when I'm not particularly interested in the products. Sometimes a good swatch can actually make me interested in something I wouldn't have thought about before! I generally like what you already do, but I think some tutorials/more makeup looks would be lovely. You do beautiful work, and you're someone I feel I can learn a lot from. I tend to prefer blog posts to videos, actually, so I wouldn't necessarily votefor more youtube videos, though I probably would watch them if you made more! Nah..nothing I can come up with at the moment >.< Your blog is great! Thank you for the wonderful feed back! The white is okay but I think a change would be nice to liven the site up a bit. Yes, I love your reviews. It's one of the best parts because we know what we're getting ourselves into when we choose to purchase a product. Yes, your swatches and product photos are helpful and very beautiful. I'd like to see more hauls just because I'm a sucker for those. I think you should change the posts to include a "click to continue" link. I'd like to see theBalm reviews. Yes I miss the YouTube tutorials. I'd love review and haul videos. I think white is a bit too stark and can be hard to look at for a long period of time. I like reviews cause I like to make more informed purchases, especially with internet shopping. The product first looks are nice but I like in-depth reviews and your opinion on the products. Things like packaging issues and quality of the products are really important to me. Your swatches are the most amazing and clear I've ever seen. You obviously put a lot of work into them. 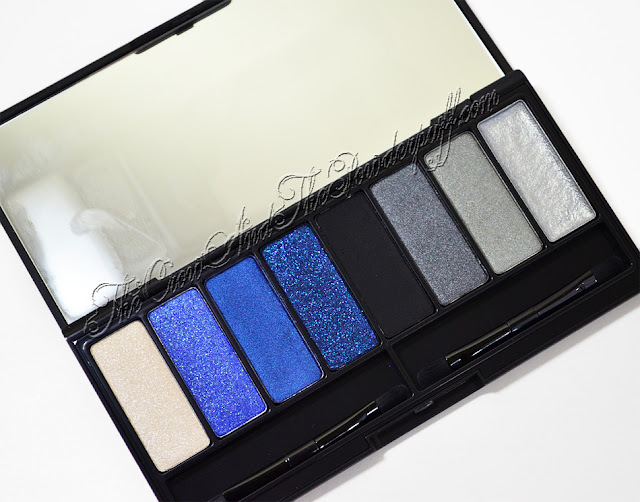 You totally show all the multichromatic or sparkle in a product and I love seeing them. If you are inspired I'd like to see more posts on FOTD or looks you create. And I definitely want to see more youtube tutorials, I am a big fan of your style and vibrant colour choices. The "continue to read" thing is ok for me, but sometimes I find it annoying that I have read a section then either have to find my place or re-read. I look forward to seeing more from you in the future. I will definitely be doing more youtube tutorials soon, just have to get things setup again for filming and such. Black text on a white (or pale gray) background is perfect. It's clean, and easy to read. Do you find the reviews helpful? / Do you find the product/swatch photos helpful? Yes. I'm on a budget and prefer to make informed choices, especially if the item in question has a high price tag. More swatch/product photos & FOTDs! I would also like to see posts about the practical side of being a freelance makeup artist: putting a kit together on a budget, how to network, etc. The "click to continue" option makes it easier to scroll through posts. Haus of Gloi, One Hand Washes the Other, Solstice Scents, Twyla Perfumes & Apothecary, Villainess Soaps, Black Rose Minerals, Femme Fatale Cosmetics, & My Pretty Zombie. Also, more Shiro Cosmetics! More tutorials! I'd also like to see product reviews. I will definitely pick up some things for the companies you mention, I've heard a lot about Haus of Gloi, and Femme Fatale Cosmetics as well. The white is good. Pastels and off-whites work well, too. Do you find the reviews helpful? - indeed! Do you find the product/swatch photos helpful? - very much. I think you do a fantastic job, and your swatches are also very pretty to look at. Should I change the posts to include a "click to continue to read" or leave the posts open on each page in full? - leave the posts as they are. Do you miss the youtube tutorials/ would you like to see me do reviews or haul videos? - very much so! Is there any other feedback you'd like to offer? I think the affilate links can be polished up. I feel like the space that the actual posts take up is too small. Also, I'm not a big fan of the italic fonts you use for headers - the logo and social network buttons don't really fit my aesthetic, either, but I figure that's just my personal taste. I wll be adding in some OCC, I have about 4 of their lip tars that I still have to review in depth so that will be coming up. I liked the banner you had before. I think most people prefer white though it's a choice between blog personality or easy to read. I also hate under the cut posts, I like posts in full. I love swatches and review the most. • What colors do you find easy on the eyes when reading a website, do you like the current white? White or any light colour is good for me, because when I have to read white on black I am not able to read much. After a few lines it starts to be uncomfortable for my eyes and when I am realy interested in the article I have to copy the text to the MS word. • Do you find the reviews helpful? Yes, definetly. Especially when reviewed products are a bit more expensive than drugstore. • Do you find the product/swatch photos helpful? A really good swatches like your’s or temptalia’s are great to see how the product looks like, so yes indeed. • What kind of posts would you like to see more of? • Should I change the posts to include a "click to continue to read" or leave the posts open on each page in full? I prefer open posts because when I am rolling down the blog and find more than one interesting articles I open them to the new bookmark and at the end of the page I have a lot of bookmarks and my browser slows down. • Is there any companies you'd like to see me review in the future? I’d like to see Too Faced or Physicians formula. • Do you miss the youtube tutorials/ would you like to see me do reviews or haul videos? Yes I love these kind of videos. i find black easy to read. I suffer from an eye disease, so this is the only color that my eye appreciates. Reviews are very helpful to me. I always research a product before spending my money. The swatches you do are amazing. So clean and so true to the real colors on the monitor and in real life. What colors do you find easy on the eyes when reading a website, do you like the current white? I like darker colors. I find sometimes that bright whites make the screen hurt my eyes. Do you find the reviews helpful? Very I love to hear what other people think about products before I buy them. Do you find the product/swatch photos helpful? Yes, I am much more likely to buy something I have seen pictures or swatches of. Should I change the posts to include a "click to continue to read" or leave the posts open on each page in full? I like having them open. Is there any companies you'd like to see me review in the future? Sugar Pill, Beauty without crulety sigma. I always appreciate any and all reviews - especially the ones on indie companies and less mainstream items. Love them! white background - black text in a basic font - what you have now is great. 1) Current color theme is okay, I prefer minimalistic look to blogs. 4) Doesnt' t matter for me, because I have fast internet connection and I don't mind scrolling down. 5) I don't have any special requests on what companies should you review. -Yes very! And I have gotten so much inspiration on here. -Yes! Now I know what I would like to buy in future. -Theme posts are awesome. I would like to see more gothic and steam punk style! I need ideas mostly of my steam punk style, so help is needed! -It is much more easier if there is all in the same page. -I love wet and wild so that! -Yes totally. On videos you can learn new tricks to do make up. -More video tutorials, more theme posts and just be awesome! -Black with white lettering, you're layout seems nice though but it would look better and dramatic on black. -Yes you make very accurate swatches and i like how you use the products. I've bought a lot of GDE because of your reviews/tutorials. -I would love to see even more reviews on indie companies, and more tutorials based on geekery. -I prefer the same page. -Yes. I love your tutorial videos, hauls would be nice. Or maybe combination videos where you show the product and do a tutorial using the products or palettes. -I'd love to see more of you, update often! 1. I think white is a good background, some sites try to get fancy and i don't like it! a pale blue or something non-neon or patterned works too. 4. I would like to see more makeup looks, especilly everyday looks, the arty ones are great but I love to see practical ones too! 8. other feedback is just that i am a new follower and the site is attractive and easy to follow, thank you! I like your makeup looks and tutorials! I do agree that simpler is better though, for some reason I'm picturing white text on a dark (black?) background. I really like comparison swatch/dupe posts. But any swatches from you are fantastic. No, for some reason I hate the click to continues, I never click them. Nah, I personally would rather read a blog and look at macro pics than watch someone hold something up and jabber about it. You have a really strong blog, so putting your blog content into video form would just be redundant in my opinion. 1. Yes, I like mostly white. 3. Definitely, I will always find swatches of products. 4. I like reviews mostly on mascara. lipstick and eyeshadow palettes. 5. Leave the post open in full. 6. Hmm, I'm not actually familiar with the newer brands. 1. Yes, the white background is fine. Usually on a typical website the color palette that I appreciate would be one that is mostly two-tone (so dark text, light back ground). When it comes to text, I think it's best to avoid anything that might make your readers squint. Avoid neon colors. Avoid exceptionally bright color like yellow or light blue. 2. Yes, your reviews are great. I appreciate that you include photos that are large enough to notice details. 3. Yes, very. Swatches are always helpful and like I said above yours are big enough that the reader can fully see the color and other detail. And you write out the specifics (ingredients, etc) which is greatly appreciated. 4. More posts on your looks. Maybe some more tutorials if it's not too much work. 5. Either way is fine, I have no preference. 7. Oh yes, I think the tutorials would be something I'd love to see more of again. Reviews and hauls on video would be greatly appreciated as well. 8. You are very talented! Thanks for asking for input!